The information contained here and your visit with your surgeon and the Pre-Anesthesia Clinic will help you get ready for surgery and understand what will happen and why. We are committed to working with you for a safe surgical experience. Pre-Anesthesia Clinic: 206-598-5053, 8 a.m. to 5 p.m.
Roosevelt Ambulatory Surgery Center: 206-598-0900, 6 a.m. to 9 p.m.
UWMC has interpreters to assist you, if needed, before and after surgery. 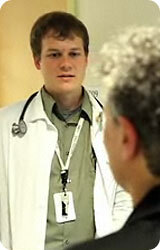 Please tell the patient care coordinator or Pre-Anesthesia Clinic nurse if you would like an interpreter. Or, call Interpreter Services at 206-598-4425 to ask for an interpreter. A complete list of all the medicines you take and the doses. The results of tests you have had at any other hospital or clinic. Before your visit to the Pre-Anesthesia Clinic, you will meet with your surgeon in a UWMC specialty clinic. At this meeting, your surgeon and other care providers will discuss your medical history and home medicines, complete a physical exam, talk with you about the surgery, and have you sign a consent form. We need information about your health before your surgery. At your pre-anesthesia visit, you will be asked to complete a health survey and a home medicine list. A list of all the medicines you take and the doses of each one. The results of tests you have had at any other hospital or clinic, especially heart or lung diagnostic testing such as an electrocardiogram (EKG), stress test, echocardiogram, pulmonary function tests, etc. We will include copies of these records in your surgical information packet. If you need help getting test results from your doctor or clinic, please ask us and we can help you. Having this information is important. It will help your doctors know about things that may affect your care and recovery. Nurses trained in anesthesia assessment will review your health survey, medical history, and home medicine list. If needed, blood tests, an EKG, and a chest X-ray will be done. Depending on your type of surgery, other tests may also be needed. You will not meet your anesthesia team at this visit, but will meet them the day of your surgery. If you have diabetes and take insulin or an oral diabetes medicine: Be sure to get instructions from the Pre-Anesthesia Clinic about how to adjust your dose of these medicines the day before and morning of your surgery. A nurse will tell you which of your medicines you can take the morning of surgery. A team of anesthesia providers will be with you during your surgery to keep you comfortable and manage your breathing, heart rate, blood pressure, and any medical issues that might arise. General — you are unconscious and have no awareness of the surgery. Regional — a numbing medicine is injected into a cluster of nerves, so you do not have sensation (feeling) in a large area of your body. You may also be given medicine to relax you or help you sleep. Local — a numbing medicine is injected into the skin and tissues near the area of surgery. This numbs only the area of surgery, similar to the local anesthetic given for dental work. You may also be given medicine to relax you or help you sleep. Please tell your nurse if you would like to discuss special concerns with an anesthesiologist during your visit. A staff member from the Pre-Anesthesia Clinic will call you the afternoon before your surgery day to verify your arrival location, tell you when to arrive, and review your pre-surgery instructions. If your surgery is on a Monday, this call will be on the Friday afternoon before. Please make sure we have the correct phone number where you can receive this pre-surgery phone call. 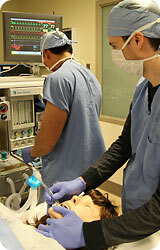 If you do not receive this call by 5 p.m., call the Pre-Anesthesia Clinic at 206-598-6334. Unless you have instructions from your doctor about bowel cleansing, eat normally and take your usual medicines the day and evening before surgery. It is very important to follow these guidelines about not eating or drinking before surgery. These guidelines reduce your chance of vomiting and inhaling stomach contents into your lungs. For your safety, if you forget and/or do not follow these fasting guidelines, your surgery may need to be rescheduled for another day. Some patients may drink liquids after midnight the night before surgery. Other patients, based on their medical condition and type of surgery, will not be able to eat or drink anything after midnight the night before surgery. The Pre-Anesthesia nursing staff will explain the guidelines that you need to follow. Do NOT drink alcohol after midnight. Do NOT drink liquids after midnight that are not clear. This includes coffee or tea with cream or milk, lattes, milk, or orange juice. Do NOT drink ANY liquids after midnight. The Pre-Anesthesia nurse will tell you if you may have up to 2 ounces (4 tablespoons) of water for taking the medicines you are allowed to take. It is important to follow the guidelines about fasting before your surgery. These guidelines are to reduce the chance of vomiting and inhaling stomach contents into your lungs. If you do not follow these guidelines, your surgery may need to be rescheduled for another day. From midnight until 4 hours before you arrive at the hospital, you may drink an unlimited amount of CLEAR liquid. This means you may have liquids such as water, clear juices (no pulp), carbonated drinks, Gatorade, and clear tea. After this time, do not drink anything before coming to the hospital. Use a special soap called Chlorhexidine gluconate (CHG) to shower or bathe, both the night before and the morning of surgery. You can buy CHG at most large drugstores. It comes as a 2% and a 4% solution. Either one is OK. A common brand is Hibiclens, but any brand is OK. Follow the manufacturer's instructions for using it. Use the CHG soap FROM THE NECK DOWN. Wash thoroughly, especially around the area of your surgery. Pat dry with a clean towel. Put on clean clothes. After your morning shower or bath, DO NOT put on makeup, deodorant, lotions, hair products, or fragrances. To lower the risk of infection, do not shave any part of your body that you do not already shave every day. If you normally shave near your surgical site, DO NOT shave that area for 2 days (48 hours) before the morning of your surgery. If you are going home on the same day you have surgery, you must arrange for a responsible adult to take you home. Your ride must be ready within 30 minutes of your discharge. Your surgery may be cancelled if you arrive without a responsible adult to drive you home, get you settled, and make sure you are safe and comfortable. You cannot take a taxi or bus home by yourself. Bring a list of your medicines, but do not bring the medicines unless you have been told to do so by the Pre-Anesthesia nurse. Bring cases to store your glasses, contact lenses, dentures, and hearing aids while you are having surgery. DO NOT bring any jewelry or other valuables to the hospital. Wear loose clothing that will be easy to take off and comfortable to wear home. Do not use any makeup, deodorant, lotions, hair products, or fragrances. A list of your medicines. Do not bring the actual medicines unless you have been told to do so by the Pre-Anesthesia Clinic nurse. A photo ID, your insurance and pharmacy insurance cards, and co-payment for discharge medicine. A copy of your health care directive and/or durable power of attorney for health care if you want one placed in your medical record. Your L&I claim number, if you have one. Your CPAP machine if you have sleep apnea and use it at night to help you breathe. On the day of your surgery, report to the location checked on page 2 of this booklet. Be assessed for health status changes. Have your intravenous line (IV) started. An IV is a small needle and thin tube that is used to deliver medicines and fluids to your body. Bring a book or a project to help pass the time. We will update you about any changes that might affect your surgery start time. Note: Female patients may receive information about urine pregnancy testing before surgery. Tell your nurse or an anesthesia staff person if you would like to be tested. The surgery "prep" area has many patients who are being prepared for surgery. In a private space, we will ask you to remove your clothes, including undergarments. You will put on a hospital gown. You will need to remove glasses, contact lenses, and hearing aids. In some cases, you will also be asked to remove dentures. Please bring cases to store these items, if you have them. You will meet the nurses and anesthesia team who will care for you during your surgery. You will be able to ask them any questions you have about your care. To reduce your risk of infection, you will be covered with a heating blanket to warm your body while you wait to go into the operating room. Ask for a heating blanket if you do not receive one. If you must bring a child age 17 or under with you to the hospital, please bring a responsible adult to be with them at all times in the waiting room. An adult support person is welcome to be with you during your "prep" time. They may be asked to step out if the need arises. Your support person may wait in the waiting room when you are transferred to surgery. Your support person may want to bring something to read while they wait. If they bring a laptop computer, they may access the Internet through DSL connections in waiting areas. We cannot provide child care. If you must bring a child age 17 or under to the hospital, please bring an adult to be with them at all times in the waiting room and other areas of the hospital. What surgery are you having done? Do not be alarmed by these questions. We know who you are. We routinely ask some or all of these questions over and over again for your own safety. Your doctor will check your medical record and talk with you or a family member to confirm your surgery or procedure site. 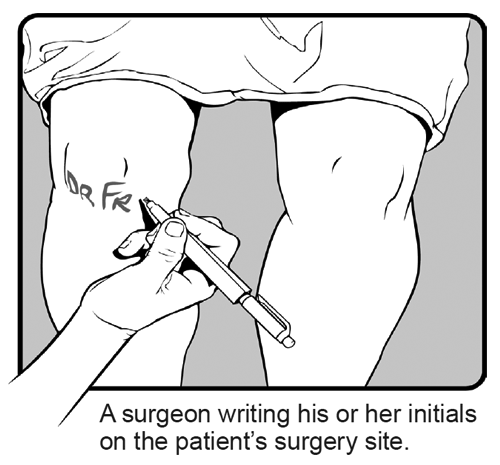 Most times when you have surgery or a procedure, your doctor will mark the site in pen to help ensure your safety. When your site does need to be marked, your surgeon will mark the site with his or her initials. Special care is taken if you are having surgery or a procedure on the right or left side of your body. Please do not mark yourself or write anything on your body. If your site does not need to be marked, you will be asked to confirm what surgery or procedure you are having. After a numbing solution is applied to your skin, an IV will be placed in a vein in your arm or in the back of your hand. Medicine and fluids can be given to you quickly and easily through the IV, and it will be in place for a while after surgery. Sometimes, you will be given medicine through this IV to help you relax, or even sleep, before going into the operating room. The recovery room is sometimes called the PACU, which stands for "Post-Anesthesia Care Unit." 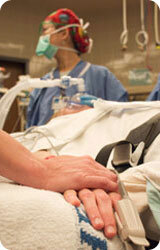 Most patients are in the recovery room for 1 to 2 hours after their surgery. In most cases, your loved ones will be able to visit you in the PACU, if you wish. This will be after you have received the care you need to ensure your safety as you wake up from anesthesia and have your pain treated, if needed. There is limited space in the PACU area, so you may have only 1 adult visitor at a time. A nurse will check your breathing, heart rate, and blood pressure often. Your nurse will help you with any nausea or pain you may feel. It is important that you are comfortable. Be sure to ask your nurse for pain medicine before your pain gets too intense. Your nurse will ask you to rate your pain on a scale of 0 to 10, where 0 is no pain and 10 is the worst pain. Medicine given through a small tube in your back (epidural). Patient-controlled analgesia (PCA). This is a machine that puts a dose of pain medicine into your IV tube when you push a button. Your doctors will prescribe the correct amount of medicine for your needs. With PCA, you do not have to wait for a nurse. You are in control of your pain relief. You will not become addicted to these medicines if you use the machine as prescribed. WARNING: Only you should push the button on your PCA. DO NOT let your visitors push the PCA button. Ask your surgeon how your activity might be limited after surgery. Think carefully about what help you will need, and arrange for this help before your surgery. If you go home the day of surgery, the person who takes you home must be able to get you into your home, stay with you, and make sure you are comfortable. You can expect to have some pain and possibly some nausea after surgery. You may also be sleepy for the rest of the day. For your safety, you will need a responsible adult to stay with you for at least 24 hours after surgery. Ask your surgeon how your activity might be limited after surgery and how long these limits will last. Think carefully about what help you will need and arrange for this help before your surgery. Work out things like how you will get to the bathroom, go up and down stairs, prepare your meals, and care for yourself. Before you leave the hospital, you will receive information about how to care for yourself at home. A follow-up appointment will be made for you, if you do not have one scheduled already.